Dutch builder Moonen has a solid reputation as a builder of small, shippy custom yachts for owners who put substance ahead of the latest fashion trends in yacht profiles, perhaps even getting type-cast as a builder of classically styled yachts up to 35 metres along the way. With the 42 metre custom yacht Sophia launched and now in final stages of fitting out, the yard is breaking the mold. This yacht, a handsome modern tri-deck that carries a three-man submarine, will debut this spring. So what is Moonen planning for an encore? Managing Director Emil Bilterijst has his eyes on owners focused on staying under the 500 GT barrier but with boats that will take full advantage of the second building facility Moonen opened in 2008 in Groot-Ammers, about 50km from Den Bosch. Moonen commissioned two new designs from René van der Velden to meet that requirement with plans that approach the goal from two different ends of the field: steel and aluminium; fast and slow. The 49-metre Moonen has an aluminium hull while the 42-metre design features a beamy steel hull with an aluminium superstructure equal in size to the 49. 'While primarily an indication of volume and as such related to the length, there are other factors involved with gross tonnage,' explains Bilterijst. A narrow, lightweight vessel with a reduced superstructure can have the same volume as a heavy, wide boat with a larger superstructure and still have a higher speed. 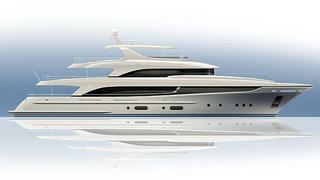 Both designs feature vertical wheelhouse windows and a Portuguese bridge while the raised foredeck on the 49 metre concept carries all the way forward to the bow. Both feature long overhangs for open-air living spaces. Interior arrangements are open to discussion but there is ample room for an owner’s stateroom on main deck forward or aft of the bridge.